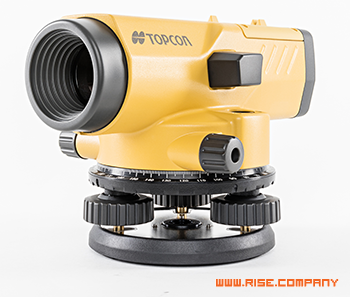 Automatic levels make use of a compensator that ensures that the line of sight remains horizontal once the operator has roughly leveled the instrument (to within maybe 0.05 degree). The surveyor sets the instrument up quickly and doesn't have to relevel it carefully each time he sights on a rod on another point. It also reduces the effect of minor settling of the tripod to the actual amount of motion instead of leveraging the tilt over the sight distance. Three level screws are used to level the instrument.